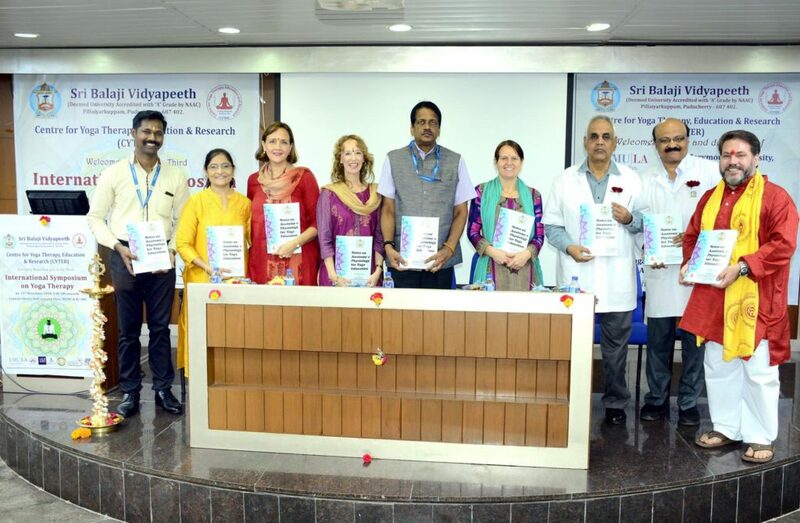 The Center for Yoga Therapy, Education and Research (CYTER), a specialised center of Sri Balaji Vidyapeeth organised its 3rd International Yoga therapy symposium at Sri Balaji Vidyapeeth on 11 December 2018. 75 participants from USA, UK, Australia, UAE, Germany, France, Ireland and various Indian states participated in the event where 5 eminent Internationally acclaimed Yoga therapists (C-IAYT certified) and other allied healthcare experts presented . There was active participation from Yoga Therapists from Loyola Marymount University of Los Angeles, California USA and ICYER at Ananda Ashram, Pondicherry. Prof SC Parija, VC of SBV was the Guest of Honour and delivered the inaugural address while Dean of Faculty Prof N Ananthakrishnan detailed the innovative integration of Yoga therapy in a modern medical setting through the CYTER of SBV.